Each month I'll be writing about the comic behind the cover featured that month in the 2018 Vintage DC Comics Calendar from Asgard Press. This month, it's All-Star Comics #2, a cover drawn by Howard Purcell. There are so many stories and creators involved that I split my examination into two posts. Part 1 talked about stories featuring Hawkman, the Spectre, Green Lantern, and Sandman. Part 2 below describes the rest of the book. this story besides follow Red and Doris around. The fourth story in All-Star #2 featured Red, White and Blue, a team of lifelong friends who each joined one of the services (Army, Navy, and Marines -- the Air Force wouldn't be spun out of the Army until 1947) when World War II broke out. Their leader, Marine Sergeant Red Dugan, and their G-2 (Army Military Intelligence) contact, Doris West, are out looking for trouble when a fire catches their attention. Investigating, they find the corpse of a murdered street cleaner and some gas tanks. Consulting a G-2 chemist, they find that the tank contained a gas named litho-ruthenium-hydro-alcohol, which he claims is impossible to make. Red and his partners Army Private Whitey Smith and Navy Petty Officer Blooey Blue begin investigating when they detect the familiar smell of that gas near their office. They soon discover that someone has stolen a secret file... or have they? It's only when the group tracks the bad guys to their hideout and the fists start swinging that Whitey and Blooey really get to do anything, but it's enough to save the day and retrieve the stolen secrets. 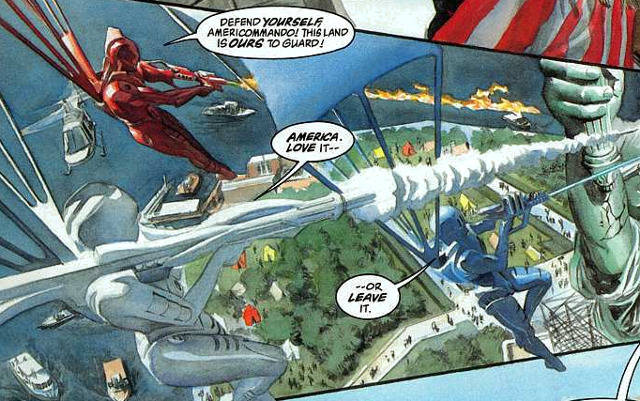 Red, White and Blue were created by this story's team of Jerry Siegel and William Smith. 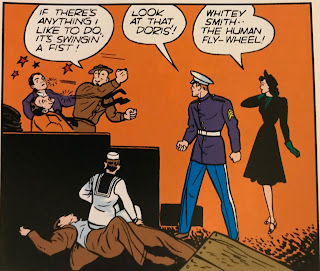 They remained an ongoing feature in All-American Comics through issue 61, then appeared a couple more times until issue 69 (November, 1945), the military heroes retired with the end of the war. 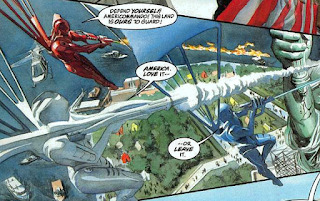 They've not been used since, though Mark Waid did develop a version of the characters for Kingdom Come. We've already talked about Jerry Siegel (and really, everyone already knows about him, anyway). His partner, William Smith, didn't do a lot of comics work, but besides creating Red, White and Blue with Siegel, also co-created King Standish with Gardner Fox. I unfortunately couldn't find reports of what Smith did after his stint with DC, especially given how common his name is. bounce all the way down the stairs first. Johnny Thunder was up next, though his story featured a stylized "Johnny Thunderbolt" logo. Johnny and his girlfriend, Daisy Darling, go with her father to check out a building he bought as a development effort, but are turned away by a thug who's running illicit gaming out of the place. Johnny clears out the place thanks to his magic thunderbolt, literally rolling up the walls to expose what's going on in the building to the public. He and his thunderbolt then have to save the day again as the thug's boss starts to arrange for accidents around the construction site. 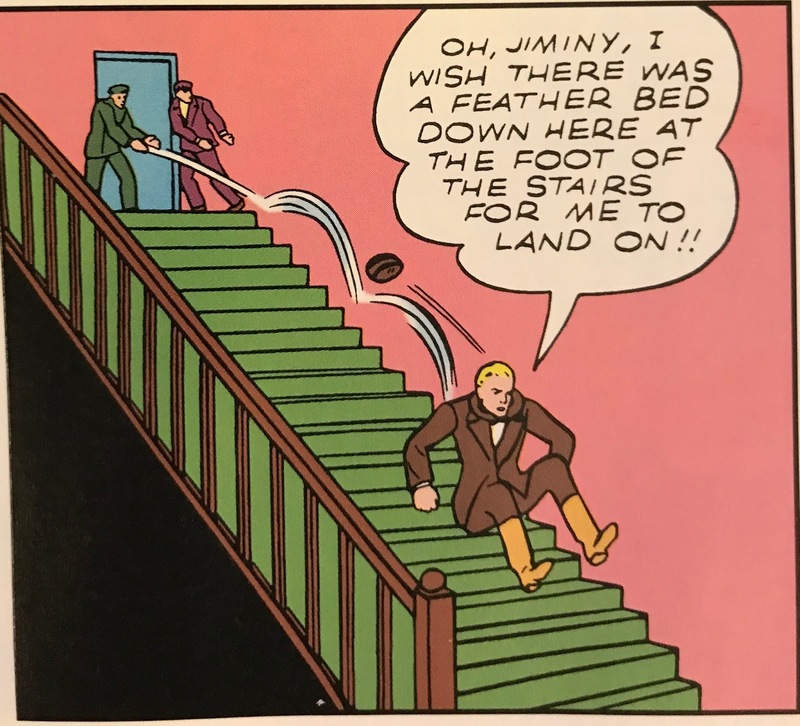 This being Johnny Thunder, of course everything is accomplished almost by accident, with Johnny not showing the quickest of thinking. But all's well that ends well, and Johnny continues to shine in his prospective future father-in-law's eyes. finally remember to say, "Cei-U"? 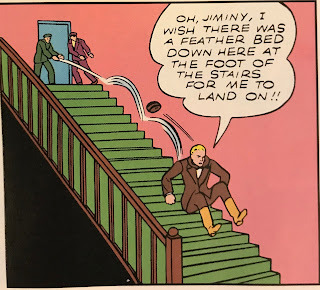 Johnny Thunder, of course, would become a member of the Justice Society of America, appearing with them starting in All-Star #3 but not actually achieving full membership until All-Star #6, when he replaced the Flash, who would graduate out of the team book into his own quarterly solo book, All-Flash Comics. Soon after this issue was published, his thunderbolt took a more human form and would more or less remain consistently drawn that way for the rest of the hero's history. Johnny's feature in Flash Comics would continue through issue 91 (January, 1948). 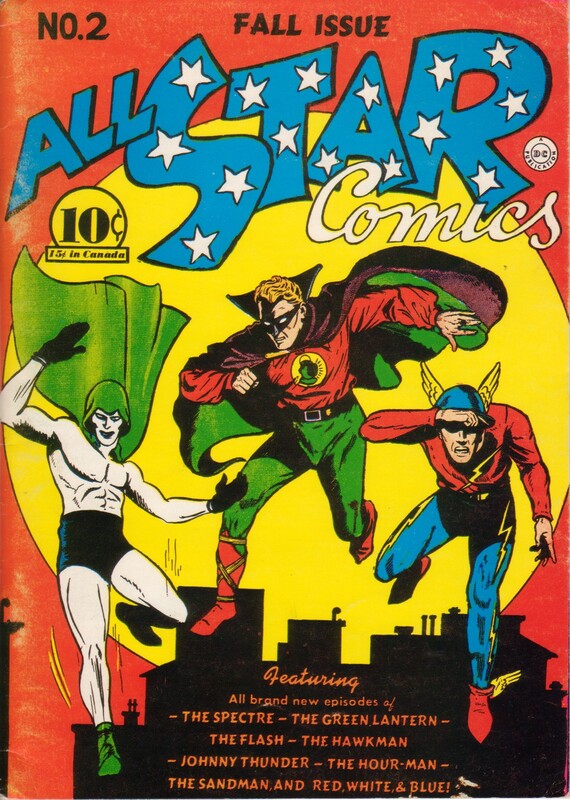 He would remain an active member of the JSA through All-Star #39 (February, 1948). Along the way, Johnny adopted a tough little girl, Peachy Pet, giving his slaptstick adventures a family flavor. Johnny would reappear with the JSA several times after they were reintroduced in the Silver Age. He eventually developed Alzheimers, but was eventually cured, then killed, then merged with his pal the Thunderbolt and continued a heroic life helping his protege, Jakeem Thunder. Johnny disappeared along with the rest of the JSA during DC's New 52 reboot, but he's back in their Rebirth storyline, seemingly the key to returning the JSA to their proper place in the DCU. Johnny was created by John B. Wentworth and artist Stan Aschmeier, who produced this story. Wentworth also created Sargon the Sorcerer with Howard Purcell during his brief comics career. Wentworth was a bit of a Renaissance man, having also been a stage actor and opera singer. He left his comics career in 1949. Aschmeier had a similarly brief comics career, though it managed to span decades due to his artwork from All-Star #13 being published in the pages of All-Star Squadron #56-58 during their "Shanghaied into Hyperspace!" story. All-Star #2 then takes a break from comic book action for a page and half text story by Evelyn Gaines. The niece of All-American publisher MC Gaines, Evelyn was one of the first female superhero comics writers in history, writing frequently for her uncle's comics, including stories for Mr. Terrific, Little Boy Blue, and Hop Harrigan. This particular story features a war with Mars, a case of global warming worse than the Earth would experience 70 years later, and surprising news to wrap things up. Many copies of this issue are probably missing the end of the story, as the other side of the page features yet another coupon for readers to cut out and send in, this time nominating features to receive their own book. One has to assume the publishers received a good amount of votes for both Flash and Green Lantern. different back in the day. Next up was a story presenting, and I quote, "'Tick Tock' Tyler (The Man of the Hour) as the Hour-Man with Minute Man Martin and the Minute Men of America". "Tick Tock", of course, is the future Justice Society founder, Rex Tyler. Minute Man Martin is Jimmy Martin, who might be better described as Minute Boy Martin. Tyler, not satisfied having a single boy sidekick like Batman, actually has an entire squad of sidekicks, with Jimmy serving as the leader of them. 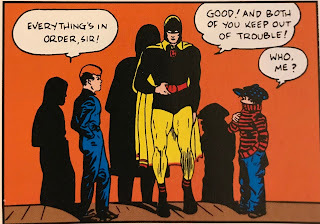 While Jimmy would at times dress up as a junior Hourman, in this story, he's merely in street clothes. The story's action is kicked off by a friend of Tyler's confiding his concerns about his brother, who is being taken for a ride by a charlatan psychic named Dr. Morte. Hourman calls in his child minions to help him thwart this villain because hey, what could possibly go wrong? While attempting to keep the bereaved mark from visiting his dead wife's grave, the boys end up being put in peril. It's up to Hourman to both reveal the secrets of Dr. Morte and save the boys from harm at the hands of Dr. Morte's circus freak assistant. 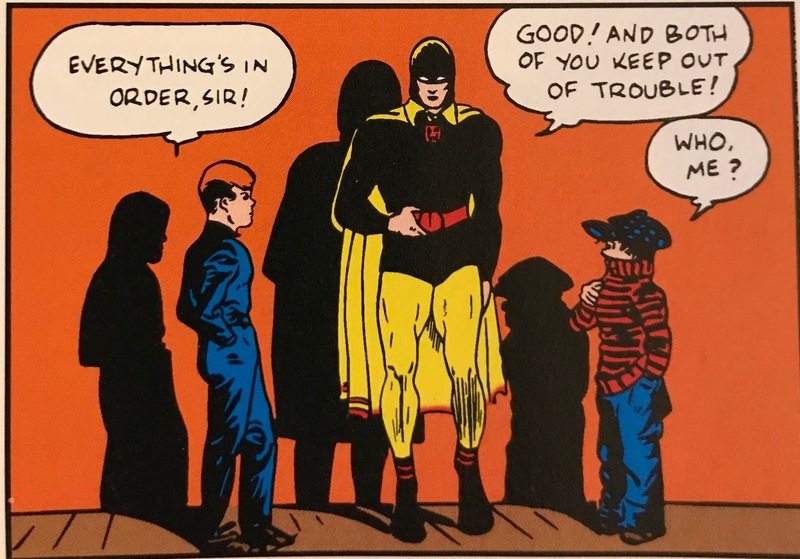 Rex Tyler first took a dose of Miraclo and became Hourman in Adventure Comics #48 (March, 1940). His solo adventures ran through Adventure #83 (February, 1943). A founding member of the JSA, he only lasted with the team a mere six issues before he was granted a "leave of absence" to make room for Starman, a new character DC wanted to push hard. This leave of absence was retroactively explained away as a result of Rex's addiction to Miraclo. He would return as an active JSA member during the Silver Age before eventually giving way to his son Rick. He would eventually fall in battle alongside his JSA comrades, aged to death by the villain Extant during Zero Hour. However, the android Hourman, constructed in the 853rd Century based on the DNA of Rex, would go back in time and rescue him and give him an extra hour of life, an hour that would only elapse while Rick visited him. However, he would be rescued fully when the android Hourman returned once more and took his place in Zero Hour. As with the rest of his teammates, Rex was written out of continuity with the New 52 reboot, but signs indicate he may return soon. Jay Garrick after being the victim of an exhibitionist. Hourman was created by artist Bernard Baily, who we've already talked about, and writer Ken Fitch. Fitch wrote some Hourman stories, but his longest running feature was Tex Thompson, which he co-created with Bernard Baily in Action Comics. It's interesting to note that Fitch grew up in Norwalk, Connecticut. Norwalk's newspaper? The Hour. The nom de plum of the Norwalk Hour's local reporter? The Hour Man. Anyone surprised they ended up married? 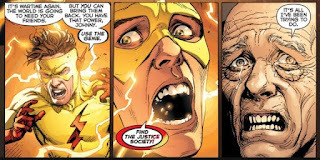 The final story of the issue featured The Flash. Jay Garrick drops in on The Daily Column to meet his friend, the editor, only to find the entire newspaper staff missing. He quickly changes to his heroic guise and writes, publishes, and distributes the day's news, with front page headlines featuring the disappearance of the paper's staff. This smokes out the gangsters, who have kidnapped everyone in a brilliant scheme to make Jay's friend sell the paper to their boss. Flash first terrorizes the crooks by pretending to be a ghost, then captures the crooks, flirting with his future wife Joan along the way. Hopefully we'll see you again soon, Jay. Jay Garrick first became The Flash in, of all things, Flash Comics #1, though the book was not a solo title, but instead was an anthology that also debuted Hawkman, Johnny Thunder, The Whip, and Cliff Cornwall. He would achieve his own solo book, All-Flash, starting in 1941. All-Flash lasted 32 issues, Flash 104. The Flash's final Golden Age appearance happened with the final appearance of his Justice Society pals in All-Star Comics #57. 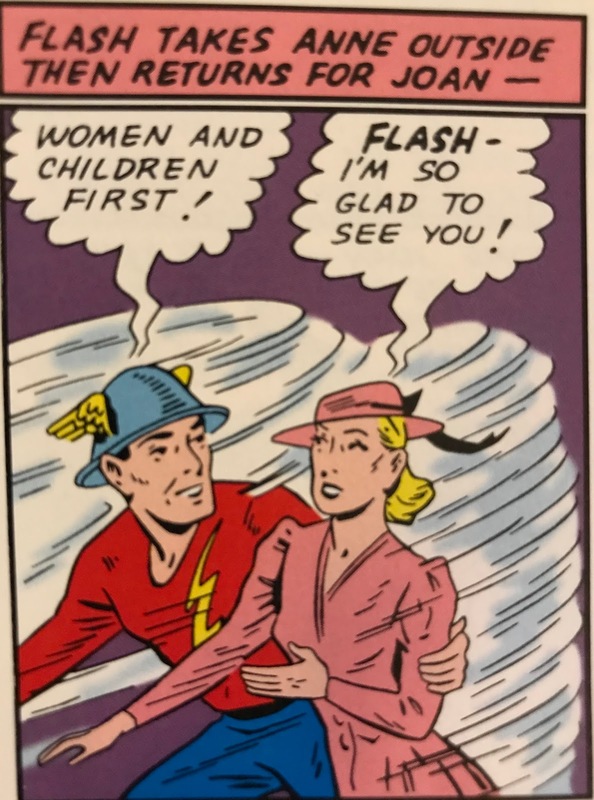 He would be the first Golden Age hero (besides those heroes who never stopped being published, like Batman and Superman) to reappear in the Silver Age in the classic story, "Flash of Two Worlds". Garrick was one of the few JSAers who would survive DC's various attempts to euthanize their Golden Age heroes, eventually becoming (after Crisis on Infinite Earths merged the parallel universes into one) a mentor to Wally West's Flash and grandfather figure to Bart Allen's Impulse. When the JSA returned to prominence in their own series, Flash was a constant presence and mentor to the next generation of Society members. He was written out of existence along with the rest of the JSA when DC rebooted to the New 52 universe, but has since reappeared in the Rebirth storyline, a harbinger of the JSA's imminent return. 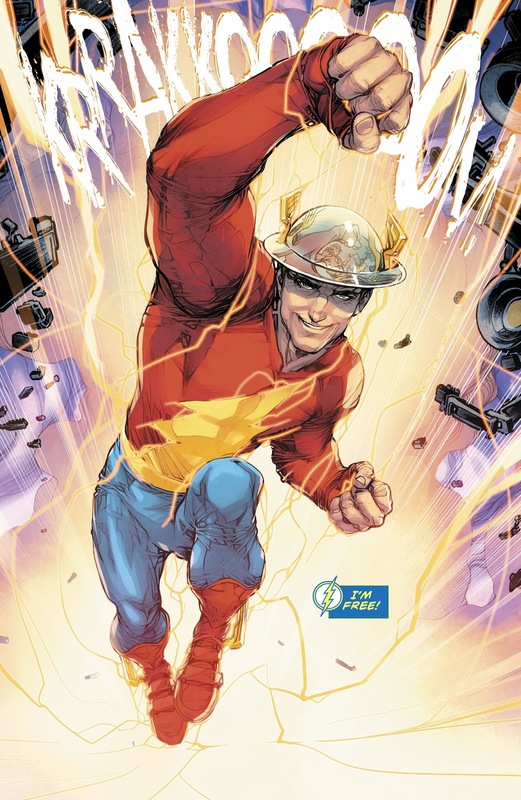 In the meantime, we've been treated to a version of Jay Garrick being included in the Flash television series, portrayed by former Barry Allen actor John Wesley Shipp. The Flash was created by writer Gardner Fox, who we talked about in Part 1 of this piece, and artist Harry Lampert, who only drew the adventures of Jay Garrick for a couple of issues before asking his editor to be removed from the strip, deciding that his style was not right for superhero comics. The artist for the Flash entry in All-Star #2 was Everett E. Hibbard, who drew many of The Flash's adventures in the Golden Age. When not drawing Flash stories, Hibbard drew stories starring his co-creation with Gardner Fox, the trio of Winky, Blinky, and Noddy, who graduated from their creation as guest stars in All-Flash to having their own feature in All-American. Hibbard would also sometimes draw the odd story of other Golden Age heroes, such as Green Lantern and Mr. Terrific.